Intense rain caused a mudslide Saturday [02/02/2019] in Bolivia that swept a half dozen cars off a highway and injured several people, officials said. The mudslide happened about 7:50 a.m. local time at a site called Puente Armas on a mountainous highway that runs between the Bolivian capital, La Paz, and Caranavi, about 58 miles to the northeast. Various media reports said the area had received heavy rains for two days. José Luis Quiroga, a transit official, was quoted as saying eight people had been rescued and taken to hospitals, La Razon reported. He said firefighters and police officers were working to rescue more people. The Erbol radio network said there were reports that some people were still trapped in the mud. 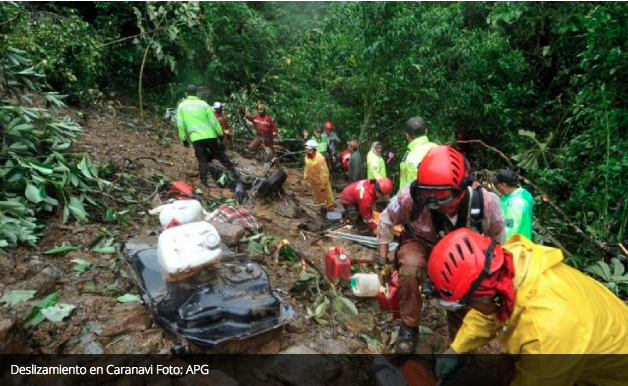 A house and its occupants were also swept away by the mudslide, La Razon reported. 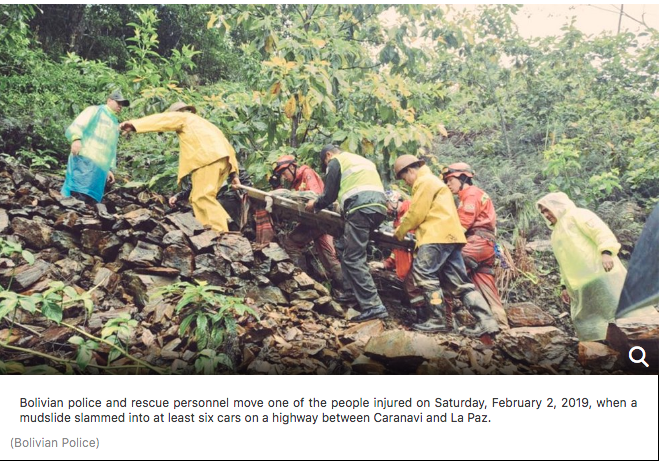 The newspaper also quoted Caranavi’s mayor, Daniel Paucara, as saying the mudslide hit a bus and six smaller vehicles. He also said 60 to 70 people were injured. The Bolivian Highway Administration said the highway has been closed. There are nine vehicles that were buried by the collapse. The commander of the Bolivian Police, Rómulo Delgado, reported today that the number of the deceased rose to 11, six adults and five children, after the landslide that occurred in the sector of the Armas bridge on the Caranavi-Yolosita highway at first hours yesterday, Saturday [02/02/2019], and that the injured total 25 injured who were evacuated to medical centers in La Paz. “The Bersa group that is working on the Armas bridge so far has managed to recover 11 bodies, six elderly people and five minors,” he told reporters. Delgado explained that he also helped and sent 16 people to the hospital in the municipality of Coroico and nine to the Arco Iris hospital in La Paz. The police chief noted that approximately 100 troops commanded by the specialized group Bersa, are in the area of ​​the collapse performing rescue work, because, in addition, there are nine vehicles that were buried by the collapse. “It is a large amount of land that has slipped, only nine small vehicles have been visible and we are seeing the possibility with the ABC machinery to enter and remove all the land that has slipped and we will surely find something more related to this fact,” he added.